The most recent release of Adobe Photoshop Lightroom is a photographer’s dream come true. The new and improved database catalogs add a new level of flexibility, control, and organization. Yet, much of the new Lightroom catalog functionality and strength isn’t being tapped into. In this article, we’ll solve that problem by providing some tips that will improve how you use Lightroom. 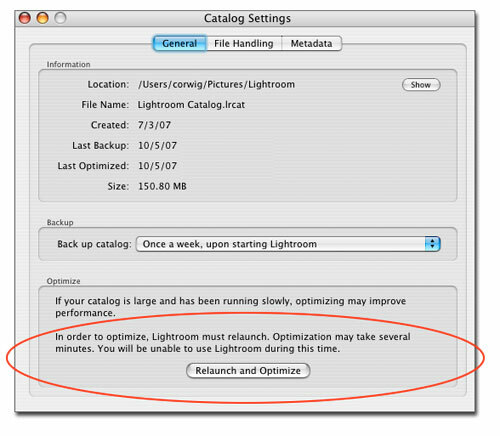 Many of my colleagues say, “The Lightroom database catolog thing is daunting…I don’t even know what a catalog is!” At first glance, it does seem confusing; so let’s dispel this misconception. For starters, a catalog is simply how Lightroom tracks file location and remembers file information—file previews, metadata, Develop module settings, ratings, keywords, and collections. Why have catalogs? They provide flexibility in managing, identifying, and organizing photos and media files. For example, you can transfer files from a laptop to desktop and preserve the changes. Think of a catalog as something that contains file location and information. Understanding catalogs is important for two reasons: First (and maybe most importantly) is that certain catalog techniques can optimize performance, i.e., make Lightroom run faster. As your image library grows in size and scale, you’ll need to take specific steps to ensure Lightroom runs quickly. The second benefit is that catalogs allow you to work in Lightroom without any loss of information across multiple computers. In this case, catalogs become instrumental. 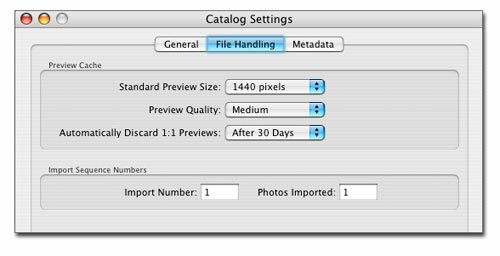 Catalogs contain valuable image information; therefore, it’s critical to back up your catalogs frequently. Choose File>Catalog Settings and in the dialog that opens, from the Back Up Catalog drop-down menu (under the General tab), choose how frequently the current catalog is to be backed up. 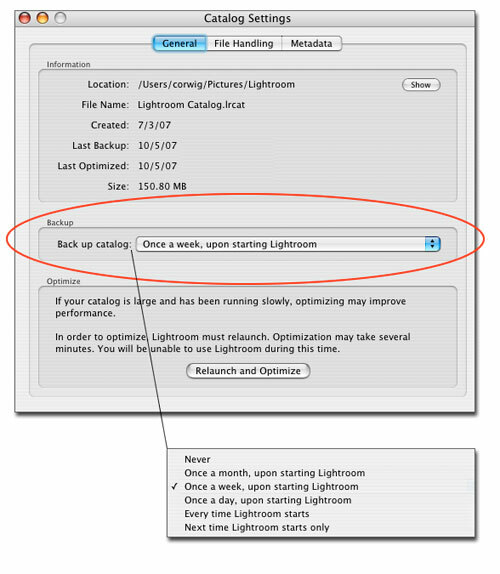 How much you use Lightroom will determine how often the catalog needs to be backed up; for example, power users would choose at least Once a Week. This way, if a catalog is accidentally deleted or becomes corrupt, the backup file may help you recover your data. One of the main advantages of using Lightroom is that it gives you quick access to large collections of images; however, you may experience performance issues as your database of images grows or if you’ve removed a number of files. If you feel as if Lightroom is “chugging,” your first plan of attack should be to Choose File>Catalog Settings and in the dialog that opens, click the Relaunch and Optimize button. Optimization takes a couple of minutes but it’s well worth the wait! To quickly view your images, the Lightroom catalog contains important file previews, and as your image library grows, the number of previews grows as well. So, in the Catalog Settings dialog, first click on the File Handling tab and choose a Standard Preview Size that’s no larger than your monitor resolution; e.g., if your laptop resolution is 1280×800, choose 1280 or less. Next, choose Medium for Preview Quality, which is probably best for most users. Finally, to keep your catalog file lean and mean, choose After 30 Days in the Automatically Discard 1:1 Previews field. 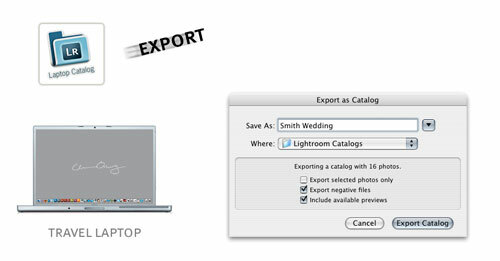 To export your catalog choose File>Export as Catalog. (Think of exporting a catalog as similar to taking your images, proof sheets, etc., and boxing them up to be sent to a new location.) Name your catalog and choose a destination folder. Be sure to check the Export Negative Files and Include Available Previews options, as these are the best choices when moving an entire catalog from one computer to another. 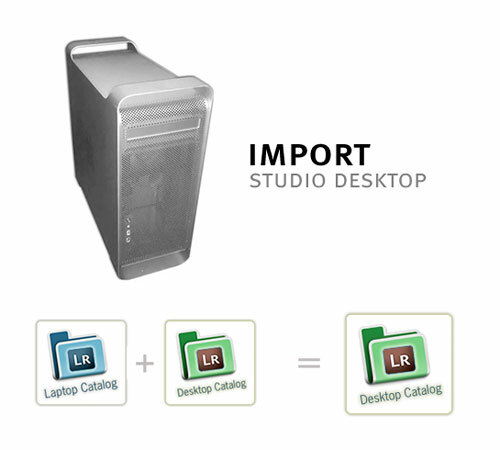 The catalog is now ready to be imported to the studio backup system so you can access it on your desktop computer. 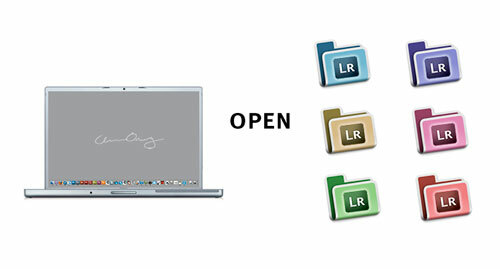 Open Lightroom on the desktop and choose File>Import from Catalog. (I like to think of importing a catalog as a merger.) What literally happens is the laptop and desktop catalogs become one, with the end result a “super” desktop catalog that contains all of the laptop catalog images, previews, information, etc. Other Lightroom workflow scenarios require sharing images and database catalogs, and in these situations, the workflow model is based on teamwork. In the following steps, let’s consider a workflow where a photographer shoots and then imports and processes images in Lightroom. 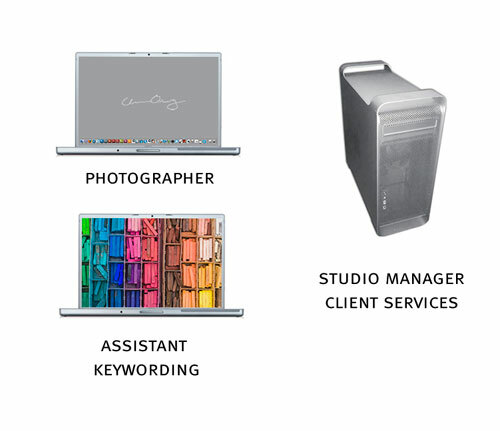 After the photographer has completed her work, an assistant adds keywords to all of the images, then finally, a studio manager will deliver the images to the client. The first step in this scenario is for the photographer to import and process the images in Lightroom. Once she has completed the workflow, she’ll have to export the catalog. 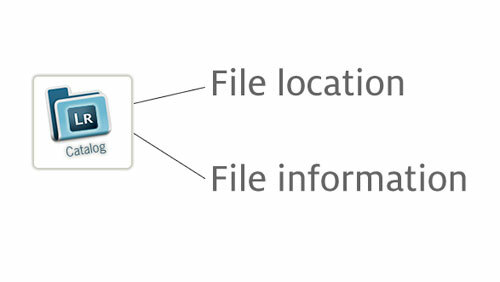 This step is identical to Step 8: Choose File>Export as Catalog, then name the catalog, and select a destination folder. Because the catalog will be shared, it’s critical to check the Export Negative Files and Include Available Previews boxes. The next step is for the assistant to add keywords to the images. 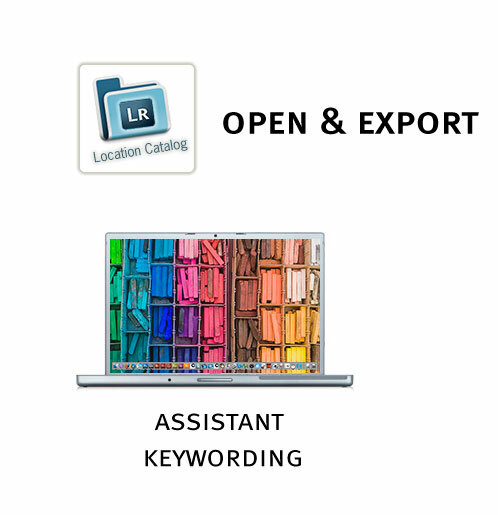 In this case, the assistant will need to open (as opposed to Import) the catalog (File>Open Catalog). The catalog will then remain intact (it won’t be merged with another catalog). When the assistant’s work is complete, he’ll need to export the catalog (File>Export as Catalog)—again choosing a name and destination for the catalog and checking Export Negative Files and Include Available Previews (because the catalog will be shared). 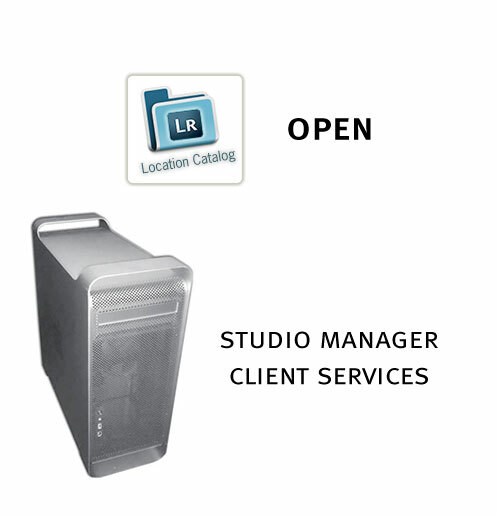 For the final step in this scenario, the studio manager opens the catalog to manage the images and deliver the files to clients, etc. In this case, the process mirrors the initial procedures in Step 12: Choose File>Open Catalog. The process is now complete. Note: If the studio manager needs the assistant to do some more keywording, the catalog would have to be exported. Now that you’ve learned some Lightroom database skills to improve your overall workflow, let’s not forget about the Achilles’ heel! So what’s our potential weakness? The database catalogs and our images live on hard drives that have a limited lifespan. Therefore, make sure to follow the words of Peter Krogh, digital asset management guru: “Don’t put all your eggs in one basket. Put your files on at least three hard drives.” If you haven’t backed up your files recently, let today be the day—you won’t regret it! Adobe Lightroom Mobile is Now Here! 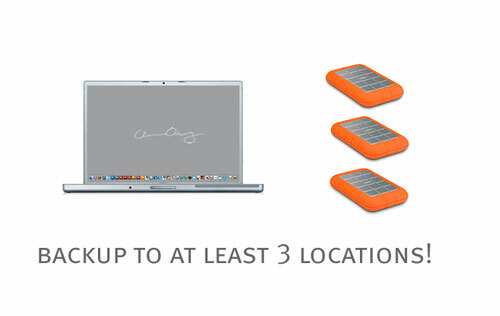 Three backup locations?! 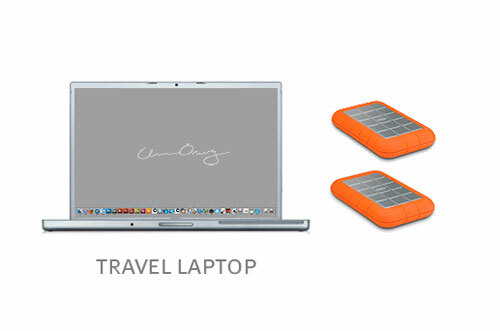 If you have the money and time to spend on getting and maintaining three backups, fine. But two should suffice: if your system breaks, you can restore it from the backup; if the backup breaks, make a new backup from your system. The chance that both your system and your backup break at the same time is very (very) small. What maybe should have been said about the “3 locations” is that at least one should be OFF-SITE, to guard against loss due to theft, fire, etc. This is great, but how the heck do you convert your existing “old school” folder database to your preferred cataloging method? Let’s say I broke my whole catalog down.I make a catalog of 2006 pictures, 2007 pictures etc. Now I have 3 catalogs and I can only one at a time. LR doesn’t give the possibitly to search outside the open catalog or? what happens If I’m building a project or collection with pictures that are in different folders I assume I can’t create a slideshow or Web page due to they are dispared in different catalogs. Is it maybe useful to have the huge catalog and the small ones. Generally working with the small ones and then for these things like slideshows etc. use the big one but I assume you can’t take the settings of the small catalogs and transfer them via synchronize folder to the huge one or? I think you found the answer. You make a collection of photos from different catalogues and use that. Once completed you have one collection of merged photos. Ok, I am learning late. Currently, I have one catalog containing all my images and the size has grown to over 40K. Now that I am learning the benefits of breaking down the content into smaller, logically oragnized catalogs, can I create new catalogs and relocate the content of the large one?